Food Loss? More Like Food Recovery! is going well! We are analyzing data from our waste audits along with our Sustainability Best Practices questionnaire with the help and support of Common Ground Compost and Brooklyn Allied Bars and Restaurants. As we work with restaurants on their waste reduction, we are finding less than 15% of restaurant waste actually needs to go to landfills! This is great news and we are working with commercial waste haulers to make sure organic and recyclables get redirected from landfills. What about food loss? Food loss is edible food that could be recovered or re purposed to feed people instead of being disposed. Taking this issue from the farm, 40% of all food grown in the US is thrown away before it’s eaten. That’s 53 million TONS of food! Not only is 1 in 6 New Yorkers food insecure, but when our wasted organics go into the landfill and break down, methane is released- which is the most harmful greenhouse gas that causes climate change. Through our Restaurant Sustainability programming, we are working to compost the inedible food waste, recycle the recyclables and feed our community with the edible food loss. 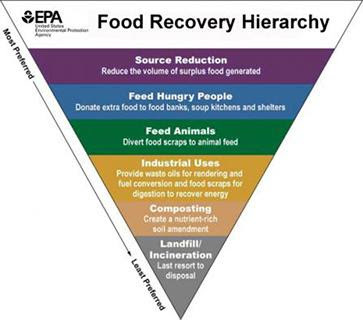 This image of Food Recovery Hierarchy created by the EPA goes into more detail. RESTAURANT PEOPLE! Stay tuned for all this and more in our Sustainability Best Practices Brochure and in the meantime, here are some great orgs that will work with you on food pick up! ← Where is our Metropolitan Bridge area Bike Route?